The decks our Omaha custom deck builders plan and construct are unique to each homeowner’s space and preferences. 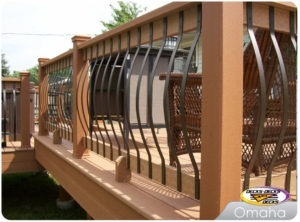 These preferences range from size to decking materials to balusters. With a wide variety of materials, our custom deck building team can provide Omaha homeowners with a truly unique deck. Deck balusters (or sometimes referred to as spindles) come in a variety of different materials. From cedar, to composite to aluminum, your options are endless. Our professional custom deck designers and builders can help you narrow your choices, and select a baluster to fit your home and decking material. Many aluminum balusters come in different shapes and designs – including arcs, twists and baskets. Additionally, lighting is also available in aluminum balusters. At Decks, Decks and More Decks our goal is to provide quality custom decks to homeowners in the Omaha-metro. This includes quality craftsmanship from our Omaha custom deck builders, quality low-maintenance decking materials and quality accessories that truly make our decks custom. This entry was posted in Custom Decks Omaha and tagged custom decks omaha, deck building omaha, decks omaha on July 28, 2016 by Decks, Decks and More Decks.